Maybe you never made it to your prom... or maybe you want to take your current significant other to the prom you never had. Join us for the prom of your dreams! We'll have live Music, prom pictures, and of course... a Prom King and Queen. The Main Room at Mardi Gras World Westbank. King and Queen will be randomly drawn from a raffle. Raffle tickets will be sold during the event so you can put the names in the King or Queen bucket - tickets will be $5, or 5 for $25. The more tickets you buy, the better chance your nominee has to win. Some of you will be in full blown formals and tuxedos. 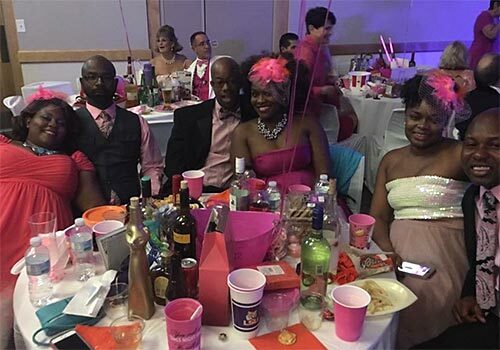 Other couples may wear a pink dress or suit adorned in pink accessories. Or maybe you don't have formal attire - no problem. Remember, this is a fundraiser... so dress in pink, be creative and let's have a great time! This event is a bring your own booze and bring your own food evening. Be sure to eat before you arrive or bring some snacks for the evening - or maybe have pizza delivered to your table! Don't forget to bring a few bottles of good wine, some champagne, or a bottle of your favorite spirit. Or maybe reminisce with a bottle of Boone's Farm! Must be 21 years of age to consume alcohol. There will be a number of items that participants can win from a raffle as well as a few items that can be bid on from the silent auction. Don't forget to buy raffle tickets for the famous Booze Cart - stocked full of your favorites!